Nikki & JD presented by DanceXchange. "Surprisingly funny. 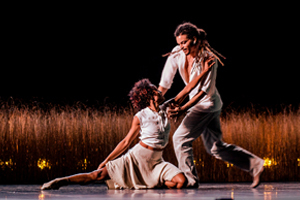 The true success of Nikki and JD's The Knot lies in the sensitive portrayal of a strong and dynamic human bond"
"A show of great complexity and breathtakingly-effortless acrobatic skill"